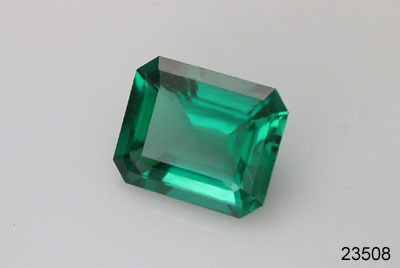 Emeralds are the familiar "Emerald Green" members of the beryl family of faceted gemstones. 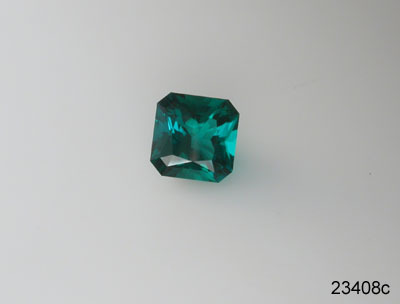 Our lab grown or created synthetic emerald gems are synthesized by the hydrothermal method. 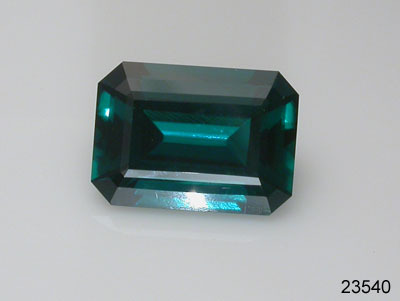 They have the same composition and physical properties, but have higher perfection than is usually seen in natural emeralds or man made flux-grown emerald cut gems. 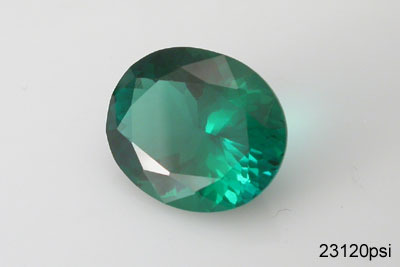 Beryl is beryllium aluminum silicate with the chemical composition Be3Al2(SiO3)6. Other members of this family include aquamarine (sea greenish-blue), morganite (pink/peach), heliodor (yellow/golden-yellow), red beryl (very rare), and goshenite (clear, colorless). 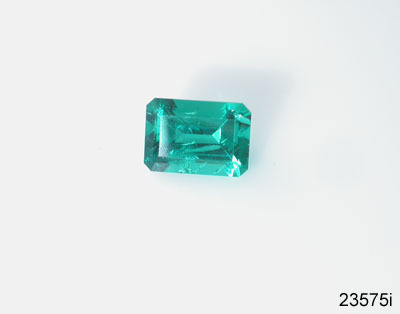 The colors of beryl are caused by dopant atoms present in small amounts -- in the case of emerald these dopants are chromium and/or vanadium. 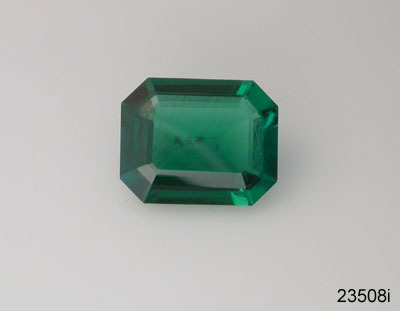 A hydrothermal emerald crystal and some cut gemstones are shown at left. 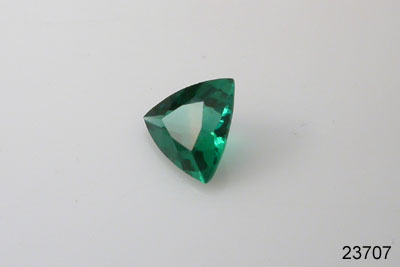 We are able to offer lab-grown emerald gemstones at a small fraction of the cost of comparable natural emerald stones. 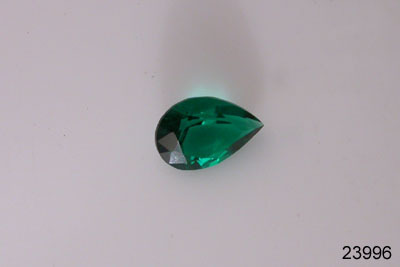 We can also set these gemstones for you in silver or gold jewelry mountings. Ask for details. You can click on any underlined Item # to see a photo of the gem. Use your browser's "back" button to return to the list. 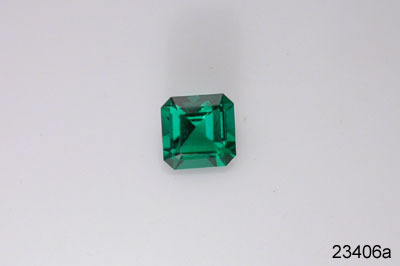 November 2018: We have some new lab emeralds available that are not yet listed below. They are various shapes and sizes, so if you don't see what you're looking for, let us know - we might have it! 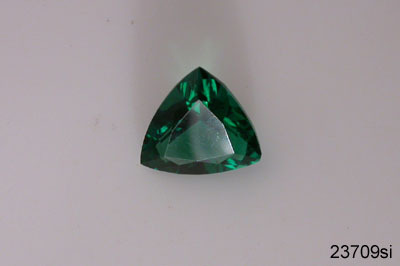 23040s 4 mm round 4mm round emeralds also come in a star brilliant cut. 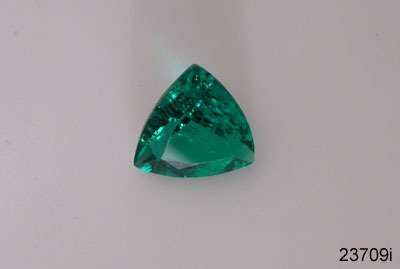 We have 3 of these lab grown emeralds available. Color and clarity are both excellent. Average weight is 0.22 ct. Priced at $75/ct and the price shown is per gemstone. 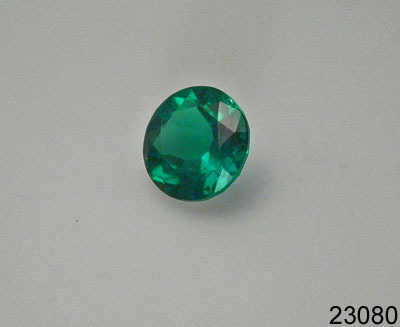 23040si 4 mm round There are 5 of these 4-mm round, Portuguese brilliant flower cut, lab-grown emeralds available. They have slight inclusions - just barely visible to the eye. Average weight is 0.22 ct. Priced at $65/ct and the price shown is per gemstone. 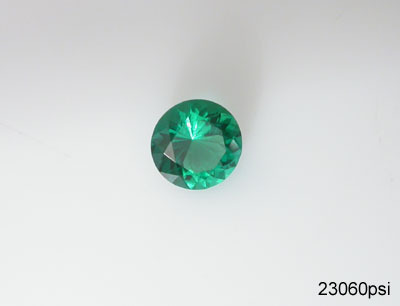 23040i 4 mm round Also in the 4mm size, we have 5 2 lab-created emeralds faceted in a round Portuguese brilliant flower cut with moderate inclusions (small inclusions visible to the eye). Their average weight is 0.22 ct. Priced at $57/ct and the price shown is per gemstone. 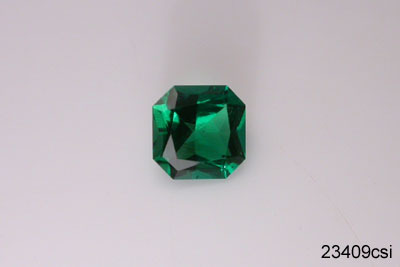 23050si 5 mm round We have nine seven three 5mm round lab emeralds in the Portuguese brilliant flower cut with slight inclusions. Color and brilliance are excellent. The average weight is 0.37 ct. Priced at $65/ct., and the price shown at right is per stone. 23050i 5 mm round In the 5mm size we also have one round, Portuguese brilliant flower cut lab emerald with moderate inclusions. It weighs 0.40 ct. Priced at $57/ct. 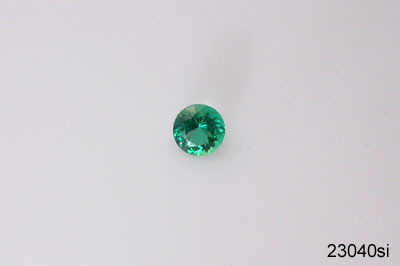 23056si 5.6 mm round Also in the intermediate 5.6mm size we have two lab emeralds that have slight inclusions. 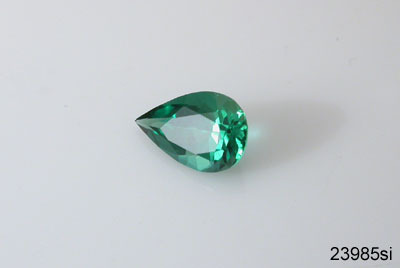 These gems are faceted in a round Portuguese brilliant flower cut, with traditional green color. The average weight is 0.52 ct. Priced at $65/ct., and the price shown is per each. 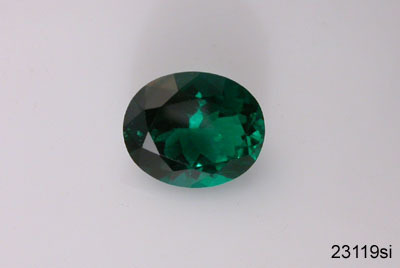 23060 6 mm round These ten seven six five four 6mm round lab-grown emeralds have excellent clarity, color, and brilliance. 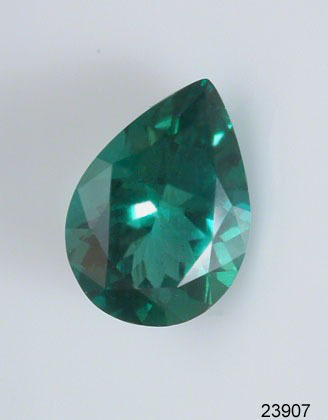 Faceted in a Portuguese brilliant flower cut, their average weight is 0.68ct. They are well matched for earrings, or could be used in other types of jewelry. Priced at $75/ct. Price shown at right is per stone. 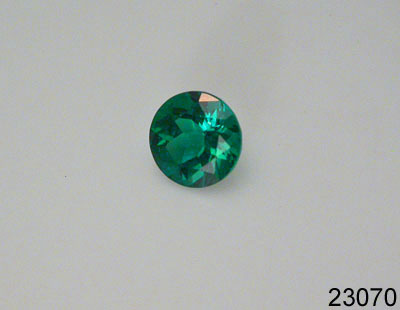 23060psi 6 mm round We have 7 2 lab emeralds available in the 6mm size faceted in a round Portuguese brilliant flower cut. They have slight inclusions and excellent color and brilliance. The average weight is 0.69 ct. Priced at $65/ct. Price shown at right is per gemstone. 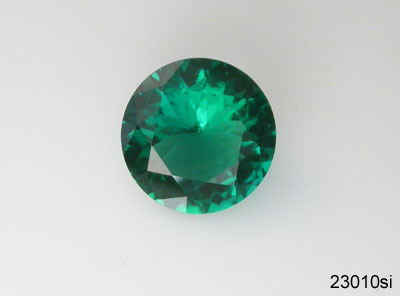 23060si 6 mm round There are four 6mm round lab grown emeralds with slight inclusions available in the star brilliant cut. Color and brilliance are excellent. The average weight is 0.72 ct. Priced at $65/ct. Price shown at right is per gemstone. 23070 7 mm round Eight Seven laboratory grown hydrothermal emerald gemstones of this 7mm round size are available in a Portuguese brilliant flower cut. Excellent brilliance, perfection, and color. Average weight is 1.04 ct. Priced at $75/ct. The price shown is per gem. 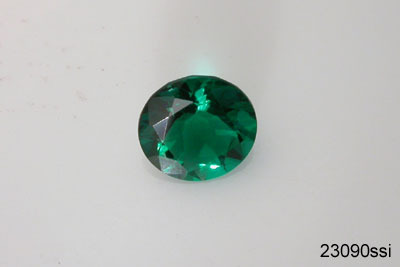 23080 8 mm round This batch of 8-mm round laboratory grown hydrothermal rich emerald-green gems has three two remaining in a star brilliant cut. Clarity and brilliance are excellent. Not identically matched. The average weight is 1.63 ct. Priced at $75/ct. Price shown at right is per gemstone. 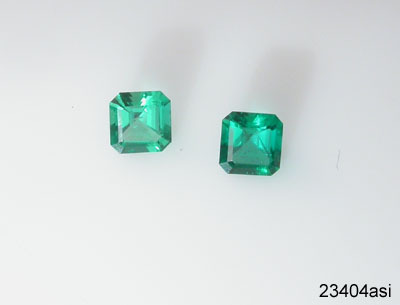 23080p 8 mm round These are very nice 8mm round lab grown emeralds. 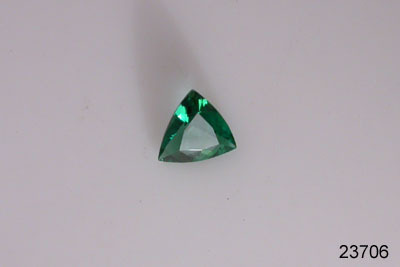 Faceted in a Portuguese brilliant flower cut, with excellent clarity (eye-clean) and traditional green color. The average weight of these 8 gems is 1.54ct. Priced at $75/ct. Price shown at right is per gem. 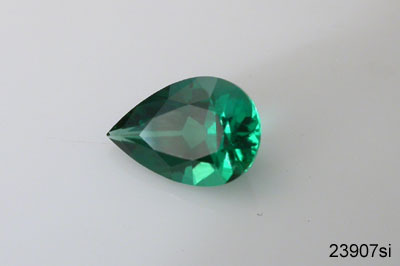 23080si 8 mm round There are nine available 8-mm round laboratory grown emeralds faceted in a Portuguese brilliant flower cut with slight inclusions. The average weight is 1.62 ct. Priced at $65/ct. Price shown at right is per gemstone. 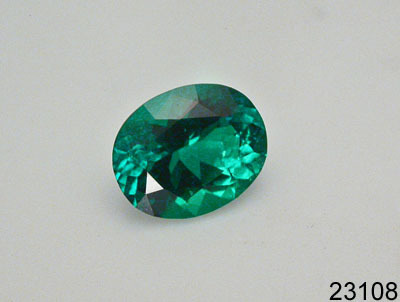 23080ssi 8 mm round This is an 8mm round lab grown emerald with slight inclusions. It's cut in the brilliant star pattern. The color is excellent. Weight is 1.85ct, and it's priced at $65/ct. 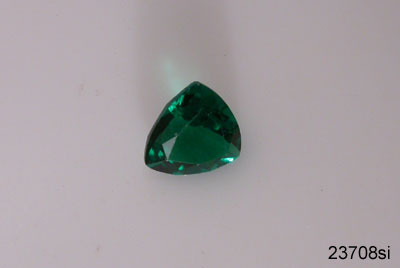 23090 9 mm round We have nine eight 9mm round Portuguese brilliant flower cut lab-created emeralds. Clarity, color and brilliance are all excellent. The average weight is 2.19 ct., priced at $75/ct. Price shown at right is per gemstone. 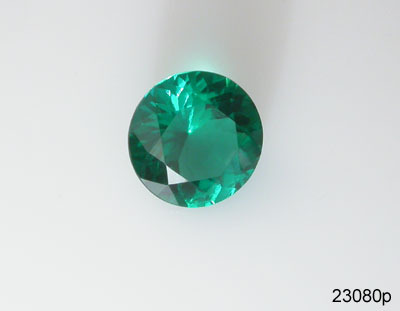 23090si 9 mm round Five 9mm round lab-created emeralds are available faceted in a Portuguese brilliant flower cut with slight inclusions. The color is a rich green. The average weight is 2.23 ct., priced at $65/ct. Price shown at right is per stone. 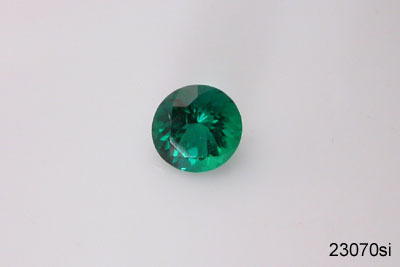 23090ssi 9 mm round There are two one 9mm round lab-created emeralds available faceted in a brilliant star cut with slight inclusions. Color is excellent. The average weight is 2.22 ct., priced at $65/ct. Price shown at right is per stone. 23010 10 mm round We have three two beautiful, large 10mm round lab grown emeralds available faceted in a Portuguese brilliant flower cut. They're eye clean, and a dark emerald green color. 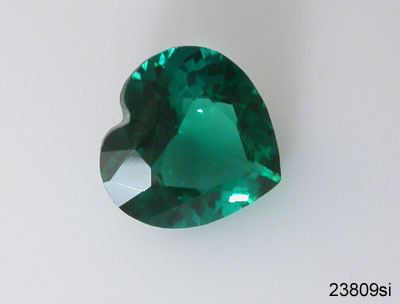 The average weight is 2.78 ct. 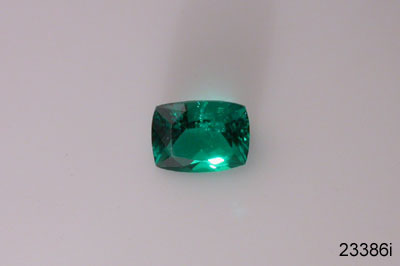 Priced at $75/ct., and the price shown is per emerald. 23010si 10 mm round There are two none hydrothermal lab-grown emeralds in the 10mm size faceted in a round Portuguese brilliant flower cut that have slight inclusions. Color and brilliance are excellent. 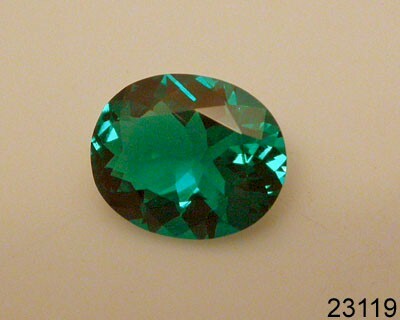 The average weight is 2.67 ct. 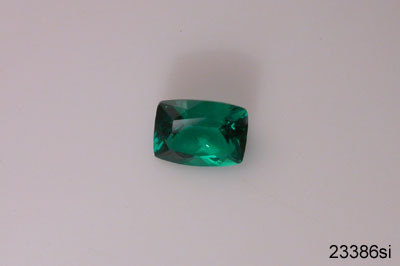 Priced at $65/ct., and the price shown is per emerald. 23010i 10 mm round We also have one 10mm round lab grown emerald in a star brilliant cut with moderate inclusions. The weight is 2.30ct. Priced at $57/ct. This is a nice gem for the price. 23153 5x3 mm oval The smallest oval lab emeralds we have are 5x3mm, and they are faceted in a Portuguese brilliant flower cut. There are two available, and they would be well matched for earrings (but are sold individually). Excellent clarity and traditional green color. The average weight is 0.20 ct. Priced at $75/ct., and the price shown at right is per gemstone. 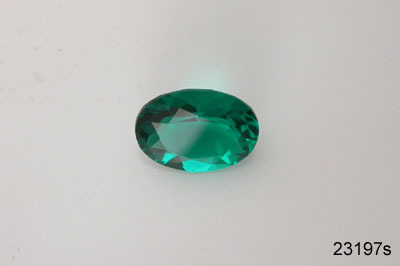 23164 6x4 mm oval There is a batch of fourteen twelve 6x4mm oval lab emeralds faceted in a Portuguese brilliant flower cut. Excellent brilliance and clarity (eye clean). The color is a rich green. Average weight is 0.38 ct. Priced at $75/ct. Price shown at right is per gemstone. Very nice for earrings or a small ring. 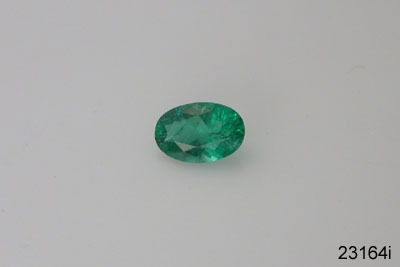 23164si 6x4 mm oval There are four lab-grown emeralds available in the 6x4mm oval size with only very slight inclusions. 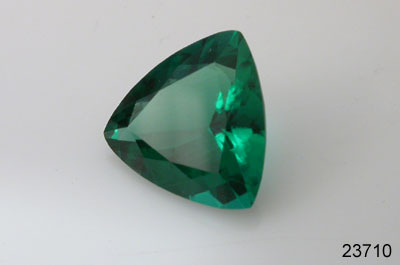 They're faceted in a Portuguese brilliant flower cut and are a beautiful green color. The average weight is 0.35 ct. 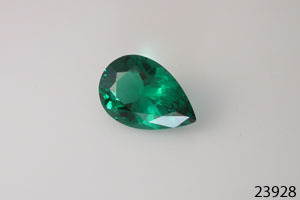 Priced at $65/ct., and the price shown is per gemstone. 23164i 6x4 mm oval We have one included 6x4-mm oval Portuguese brilliant flower cut created emerald available. 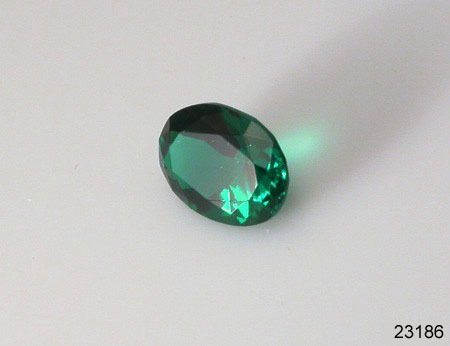 The gem is basically clean, but with a few inclusions visible to the unaided eye. The weight is 0.35 ct. Priced at $57/ct. 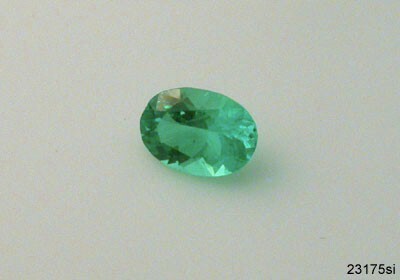 23175 7x5 mm oval We have 6 5 of these 7x5mm oval lab emeralds faceted in a Portuguese brilliant flower cut. Color, brilliance and clarity are all excellent. Average weight is 0.66 ct. Priced at $75/ct. Price shown at right is per stone. 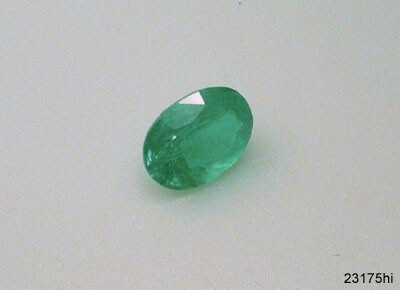 23175si 7x5 mm oval There are 15 of these slightly included 7x5-mm oval Portuguese brilliant flower cut lab grown emeralds available, at $65/ct with an average weight of 0.65 ct. There are quite a few small inclusions which are not very noticeable to the eye, but readily visible under 10x. These are versatile stones - consider earrings, a ring, or a small pendant. The price shown is per gemstone. 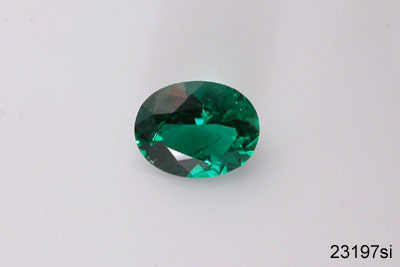 23175i 7x5 mm oval These lab grown emeralds have moderate inclusions and are faceted in a 7x5mm oval Portuguese brilliant flower cut. The average weight is 0.63ct. Priced at $57/ct. Two available. 23175hi 7x5 mm oval These two one 7x5-mm oval Portuguese brilliant flower cut hydrothermally grown emeralds are heavily included - they have large inclusions readily visible to the eye. They average 0.70 ct., and are priced at only $32/ct. The price shown is per gemstone. 23186 8x6 mm oval These lab grown hydrothermal gems are faceted in 8x6-mm ovals. There are 1110 9 7 6 available (priced per stone). Nice clean stones with a lot of sparkle for earrings, rings, pendants, or other jewelry. Oval Portuguese brilliant flower cut. Average weight is 1.08 ct. Priced at $75/ct. 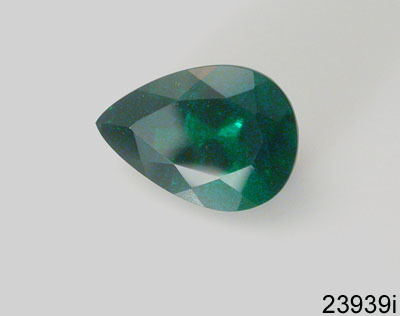 23186si 8x6 mm oval There are five four three 8x6mm oval lab-grown emeralds faceted in a Portuguese brilliant flower cut and containing slight inclusions. Brilliance and color are excellent. Average weight is 1.02 ct. Priced at $65/ct., per stone. 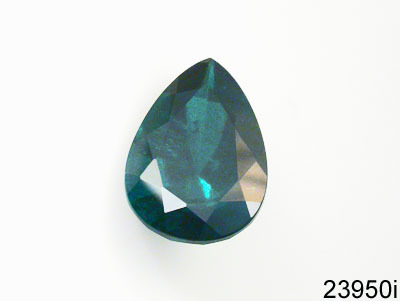 23197 9x7 mm oval We have ten of these lab grown hydrothermal gems are faceted in 9x7-mm ovals. Nice eye-clean stones with a lot of sparkle for earrings, rings, pendants, or other jewelry. Oval Portuguese brilliant flower cut. Average weight is 1.62 ct. Priced at $75/ct. ; per gemstone. 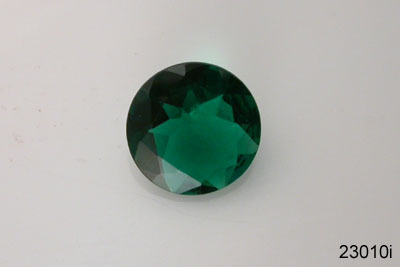 23197s 9x7 mm oval There are four lab grown emeralds faceted in a 9x7-mm oval star brilliant cut available. Clarity is excellent. This is a nice versatile size. Average weight is 1.48 ct. Priced at $75/ct. The price is per gem. 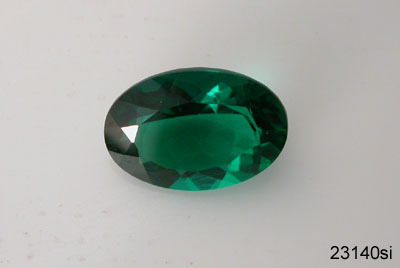 23197si 9x7 mm oval 8 slightly included 9x7mm oval lab grown emeralds are available in a Portuguese brilliant flower cut. This is a nice versatile size. Average weight is 1.52 ct. Priced at $65/ct., and the price shown is per gemstone. 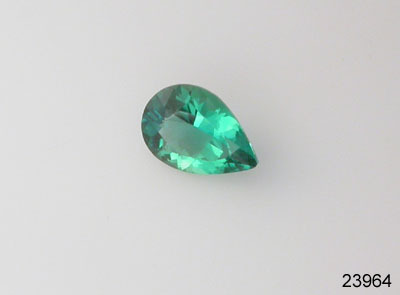 23108 10x8 mm oval Three available, faceted in a 10x8-mm oval Portuguese brilliant flower cut. 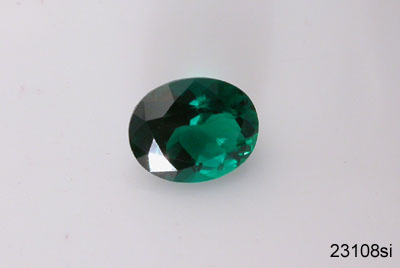 Created hydrothermal gemstones with a rich emerald color and excellent perfection. Average weight is 2.22 ct. Priced at $75/ct. Price shown at right is per stone. 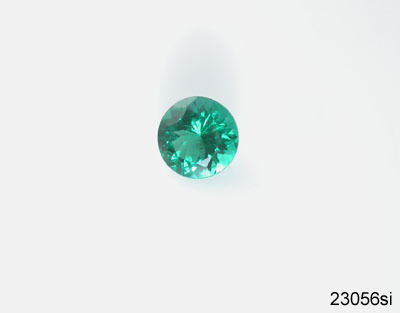 23108si 10x8 mm oval Six created hydrothermal emeralds are available, faceted in a 10x8-mm oval Portuguese brilliant flower cut. These gems have excellent color and are slightly included. Average weight is 2.07 ct. Priced at $65/ct. Price shown at right is per gemstone. 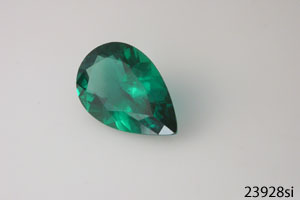 23108i 10x8 mm oval One created hydrothermal emerald is available faceted in a 10x8-mm oval Portuguese brilliant flower cut. 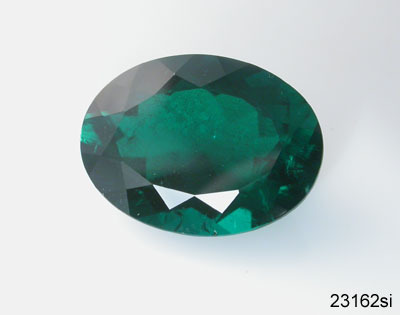 This gem has inclusions visible by eye. 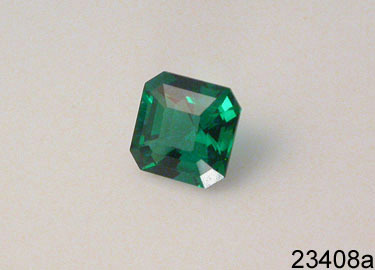 The weight is 2.33 ct. Priced at $57/ct. 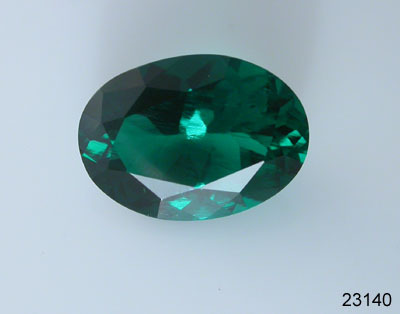 23119 11x9 mm oval There are 6 of these lab grown hydrothermal emerald gems faceted in an 11x9-mm Portuguese brilliant flower cut oval. 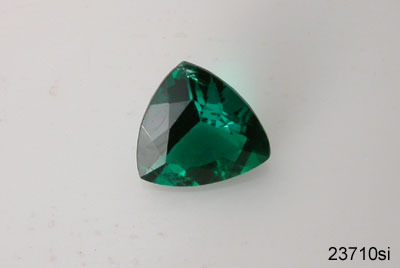 Very clean stones with a traditional emerald-green color. The average weight is 2.95 ct. Priced at $75/ct. The price shown is per gem. 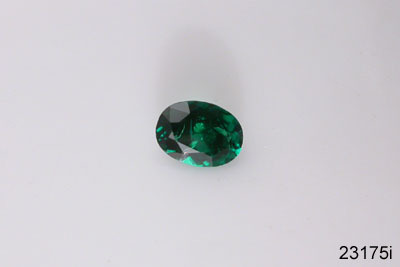 23119si 11x9 mm oval We have 3 lab grown hydrothermal emeralds faceted in an 11x9-mm Portuguese brilliant flower cut oval with slight inclusions. The average weight is 2.95 ct. Priced at $65/ct. The price shown is per stone. 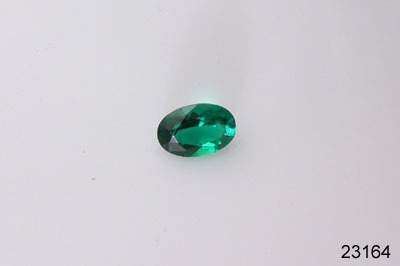 23120 12x10 mm oval Ten Nine Eight lab grown emeralds are available in the large size of 12x10mm. They're faceted in an oval Portuguese brilliant flower cut. These are beautiful gems with great clarity and color. 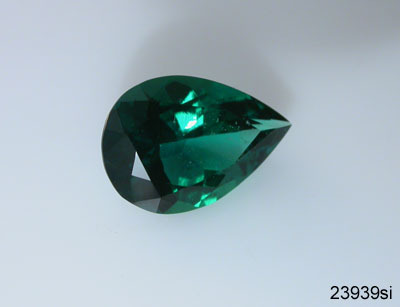 The average weight is 3.63 ct. Priced at $75/ct., per gem. 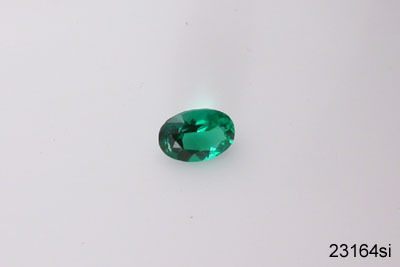 23120psi 12x10 mm oval We also have five four 12x10mm oval lab-created emeralds with slight inclusions faceted in a Portuguese brilliant flower cut. 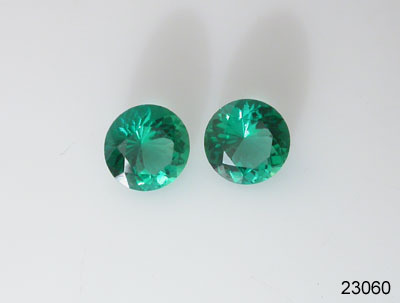 These are brilliant gems with classic green color. 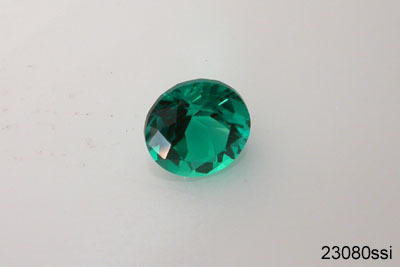 The average weight is 3.76 ct. Priced at $65/ct. Price is per gemstone. 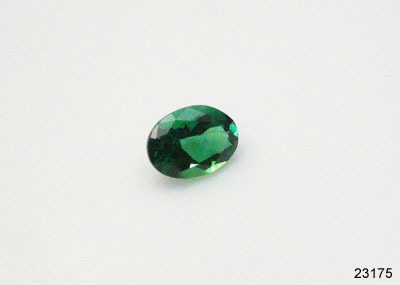 23120i 12x10 mm oval Also in the 12x10mm oval size we have a lab grown emerald with moderate inclusions, and faceted in a brilliant star cut. It's a rich green color. 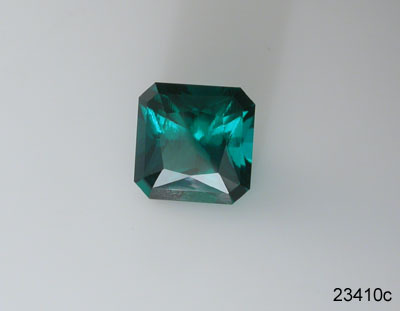 The weight is 3.21 ct. Priced at $57/ct. 23140i 14x10 mm oval Also in the 14x10mm size, we have a Portuguese brilliant flower cut oval with moderate inclusions, available for a lower price. 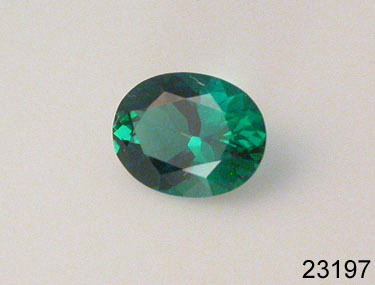 Nearly half of the gemstone has a sheet of small inclusions, as can be seen in the photo. 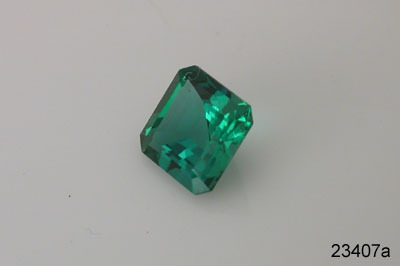 This lab-grown emerald weighs 4.21ct., and is priced at $57/ct. 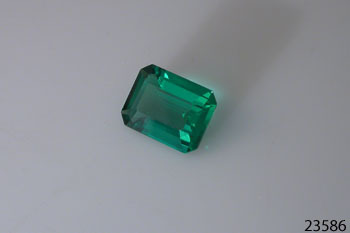 23375si 7x5 mm cushion cut There is a pair of 7x5mm cushion cut lab-grown emeralds available, with slight inclusions. These would make excellent earrings! The average weight is 0.75ct. Priced at $65/ct., and the price shown is per gemstone. 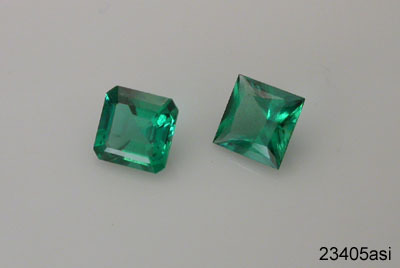 23386 8x6 mm cushion cut These two 8x6mm cushion cut lab emeralds have excellent clarity, brilliance, and rich green color. The average weight is 1.22ct. Priced at $75/ct., per gemstone. 23386si 8x6 mm cushion cut We have three lab grown hydrothermal emeralds in the 8x6mm size cushion cut with slight inclusions. The color of each is a nice emerald green. The average weight is 1.18ct. Priced at $65/ct. 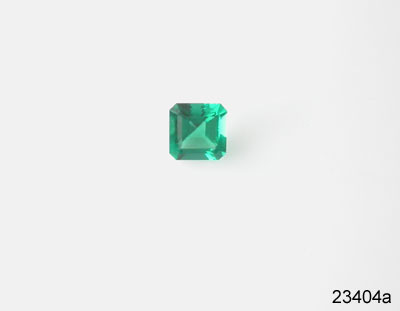 23386i 8x6 mm cushion cut We also have two lab grown hydrothermal emeralds in the 8x6mm size cushion cut with moderate inclusions and excellent green color. 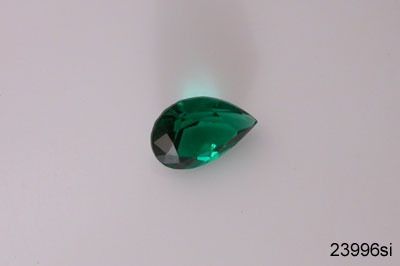 The inclusions make the gems look more like most natural emeralds. The average weight is 1.17ct. Priced at $57/ct. 23308 10x8 mm cushion cut These are gorgeous gems! Faceted in a 10x8mm cushion cut, with excellent clarity, brilliance and color. Three are One is available, and the average weight is 2.49ct. Priced at $75/ct. The price shown is per gemstone. 23404L 4 mm square princess cut Princess-cut in a 4-mm square shape. 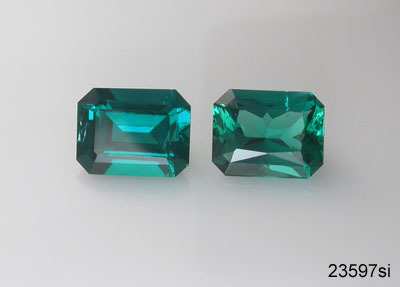 This matched pair of one man made hydrothermal emerald gemstones have excellent perfection and are relatively light in color tone. The average weight is 0.27 ct. Priced at $75/ct. The price shown at right is per gemstone. 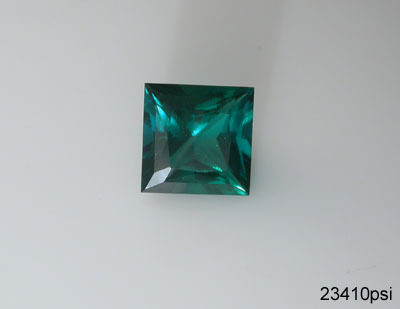 23404si 4 mm square princess cut We have five 4mm square Princess-cut man made hydrothermal emerald gemstones with very slight inclusions. These would be perfect as earrings. The average weight is 0.28 ct. Priced at $65/ct. The price shown at right is per gemstone. 23404a 4 mm square Asscher cut Six Four created hydrothermal emeralds are available in the small 4mm size with excellent clarity. They're faceted in an Asscher cut (like the classic emerald cut, but square instead of rectangular). The average weight is 0.25 ct. Priced at $75/ct. The price shown is per gemstone. 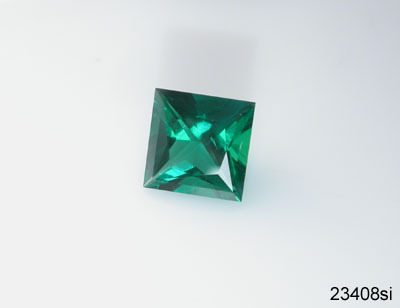 23404asi 4 mm square Asscher cut We also have two 4mm square Asscher cut lab-grown emeralds with slight inclusions. Both are shown in the photo. The average weight is 0.20 ct. Priced at $65/ct. The price shown at right is per gemstone. 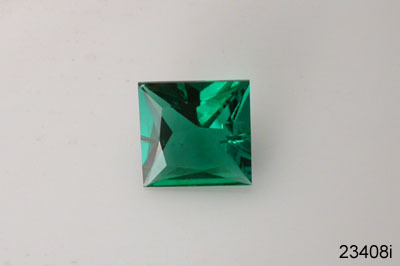 23405p 5 mm square princess cut We have eight lab grown emeralds princess-cut in a 5mm square that are eye clean. There is some color variation from medium to dark green. The average weight is 0.52 ct. Priced at $75/ct. The price shown is per gemstone. These would be perfect as earrings, or consider a small ring. 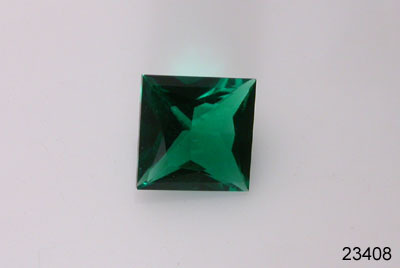 23405si 5 mm square princess cut There are three lab grown emeralds princess-cut in a 5mm square with slight inclusions. Color is a very nice emerald green. The average weight is 0.55 ct. Priced at $65/ct. The price shown is per gemstone. 23405a 5 mm square Asscher cut In the 5mm square size we have seven lab grown Asscher-cut emeralds with octagonally cut corners. The clarity of these gems is excellent, as is the brilliance and color. Average weight 0.51ct, priced at $75/ct. Priced per gem. 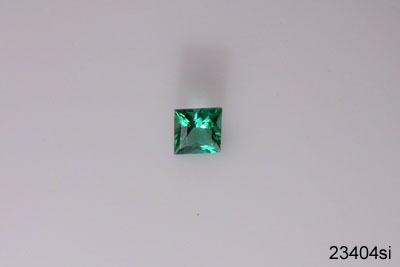 23405asi 5 mm square Asscher cut These lab emeralds are like the ones designated as 23405a, but these gems have slight inclusions. The color and brilliance are not affected; these are very nice stones. They would be perfect for earrings or a small ring. We have eight six of them and the average weight is 0.50ct, priced at $65/ct. Priced per gemstone. 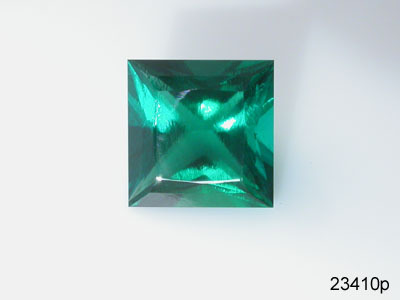 23406 6 mm square princess cut We also have five lab grown emeralds princess-cut in a 6mm square. Eye clean and traditional green color. The average weight is 0.88 ct. Priced at $75/ct. The price shown is per stone. 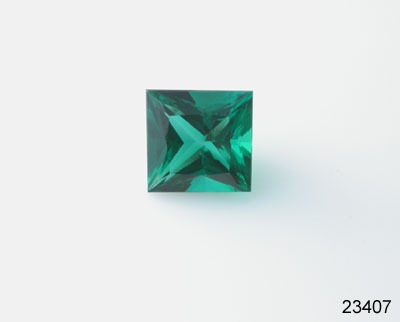 23406si 6 mm square princess cut In the 6mm size we have five lab grown emeralds princess-cut in a square shape, with slight inclusions. The average weight is 0.88 ct. Priced at $65/ct. The price shown is per gemstone. 23406a 6 mm square Asscher cut An Asscher cut is like a square version of the classic emerald cut. 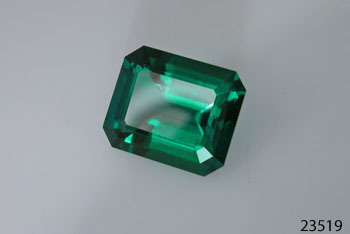 There are six five four 6mm square Asscher cut lab grown emeralds. 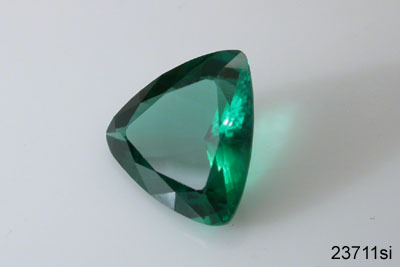 Eye-clean gems with beautiful green color. The average weight is 0.96 ct. Priced at $75/ct. The price shown is per gemstone. These gems would work well as earrings, for a ring, or as a delicate pendant. 23406asi 6 mm square Asscher cut In the square version of the classic emerald cut we have eight six 6mm square Asscher cut lab grown emeralds with slight inclusions. The average weight is 0.96 ct. Priced at $65/ct., and the price shown is per gemstone. 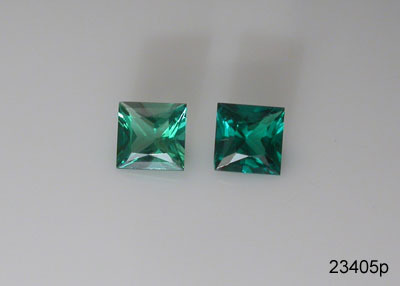 23406c 6 mm square cut corner radiant These two one lab grown emeralds are faceted in a square cut corner radiant pattern. They measure 6mm on a side, and weigh 0.91ct. on average. Clarity and color are excellent. Priced at $75/ct. 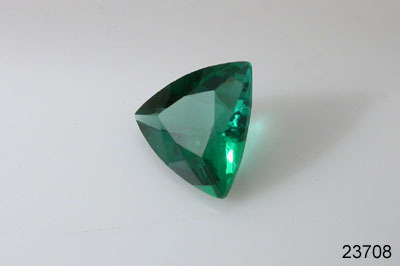 ; the price shown is per gemstone. 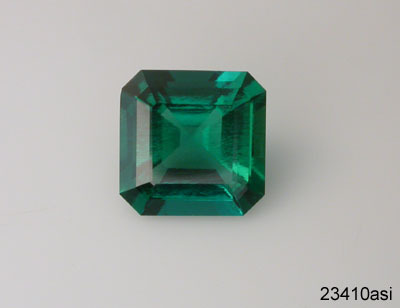 23407a 7 mm square Asscher cut Five Four gorgeous lab-created emeralds are available faceted in an Asscher cut. These would be appropriate for a wide variety of types of jewelry. The clarity is excellent. Average weight 1.34 ct. Priced at $75/ct. The price shown is per gem. 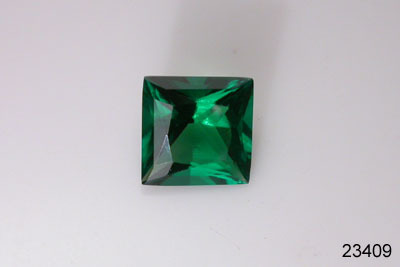 23407 7 mm square princess cut There are four lab-grown emeralds faceted in a 7mm square princess cut with excellent clarity and traditional emerald green color. The average weight is 1.32 ct. Priced at $75/ct., and the price shown at right is per gem. 23407si 7 mm square princess cut We have 3 2 lab grown emeralds in a 7mm square princess cut, with slight inclusions. They have excellent green color. The average weight is 1.45 ct. Priced at $65/ct. The price shown at right is per gem. 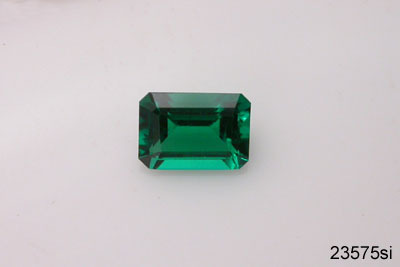 23407c 7 mm square cut-corner radiant In the cut-corner radiant faceting style, there is one 7mm square lab grown emerald available with excellent clarity. It weighs 1.19ct, and is priced at $75/ct. 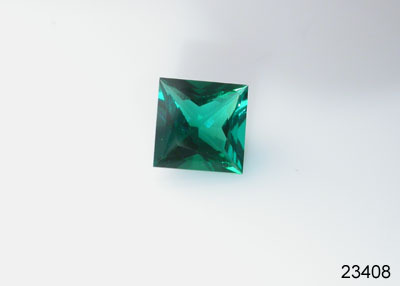 23407csi 7 mm square cut-corner radiant Also in the cut-corner radiant style, 7mm square size, there are two lab emeralds that have slight inclusions. They're both very nice green colors; one lighter and one darker. Their average weight is 1.41 ct. Priced at $65/ct. The price shown at right is per gem. 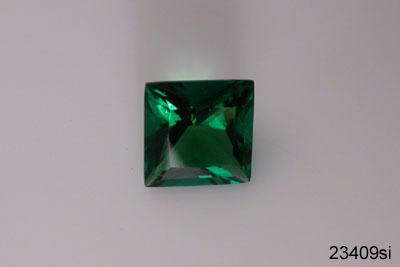 23408 8 mm square princess cut There are 4 3 lab grown emeralds with excellent clarity available in an 8mm square princess cut. The average weight is 2.04 ct., priced at $75/ct. These are very nice gems! 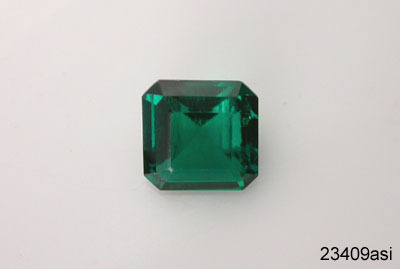 23408si 8 mm square princess cut Also in the 8mm square size, we have three princess-cut lab grown emeralds with slight inclusions. The inclusions are small, but may be visible to the eye. Excellent sparkle and color. The average weight is 2.01 ct. Priced at $65/ct. ; price shown is per gem. 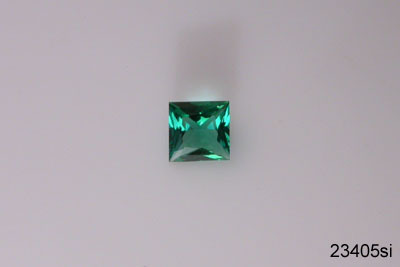 23408i 8 mm square princess cut There is one 8mm square lab grown emerald with a visible inclusion faceted in a princess cut. The cut and color are excellent. 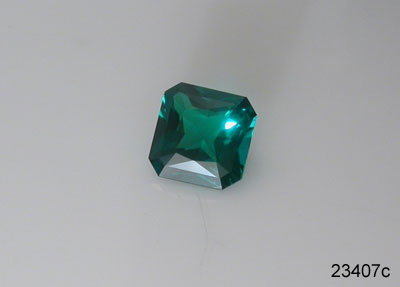 The weight is 1.62 ct. Priced at $57/ct. 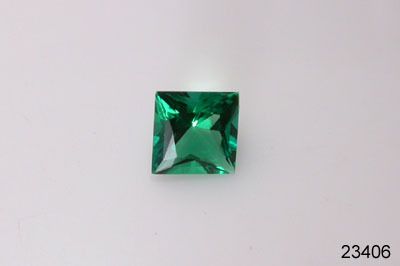 23409 9 mm square princess cut We have two lab grown emeralds available in a 9mm square princess cut. 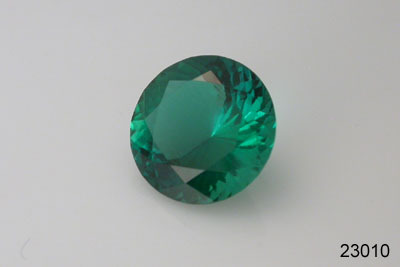 They have excellent clarity and a rich green color. The average weight is 2.75 ct. Priced at $75/ct. The price shown at right is per gemstone. 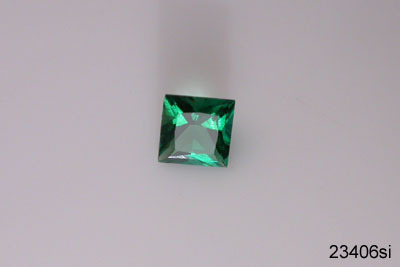 23409si 9 mm square princess cut There is one lab grown emerald available in a 9mm square princess cut with slight inclusions. The color is a rich emerald green. 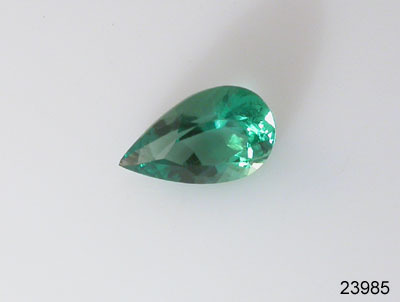 The weight is 2.93 ct. Priced at $65/ct. These 15 13 man made hydrothermal emeralds are all eye clean and cut in a 6x4-mm rectangular octagon shape. Color ranges from medium green to deep bluish green. 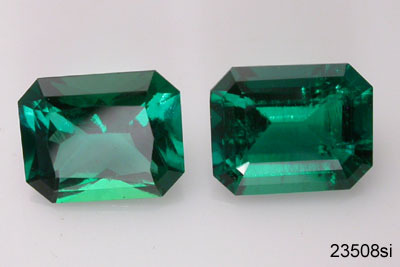 13 11 of them are faceted in a traditional step cut, and 2 are cut-corner radiant (not shown, but similar to the gem on the left in the 23564si photo). The average weight is 0.48 ct. Priced at $75/ct. The price shown at right is per gemstone. 4 cut-corner radiant gems and 5 3 2 step cut (shown at right in the picture), all in a 6x4-mm rectangular octagon shape. 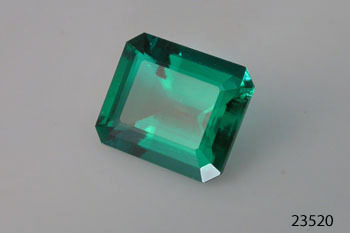 These man made hydrothermal emeralds have slight inclusions. The average weight is 0.43 ct. Priced at $65/ct. The price shown is per gemstone. 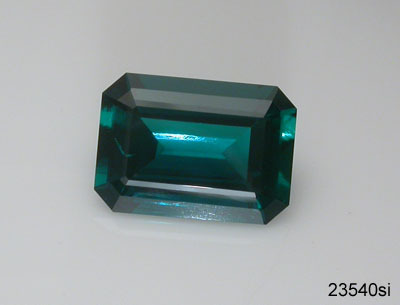 23575 7x5 mm emerald cut These five four 7x5mm man made hydrothermal emeralds are step cut in a rectangular octagon shape. Eye-clean, with rich green color. The average weight is 0.79 ct. 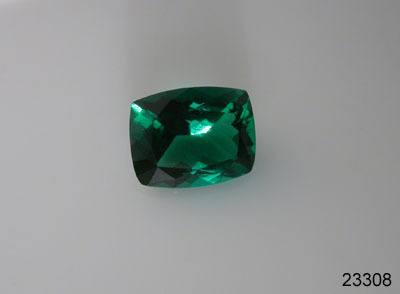 Priced at $75/ct., and the price shown is per gemstone. 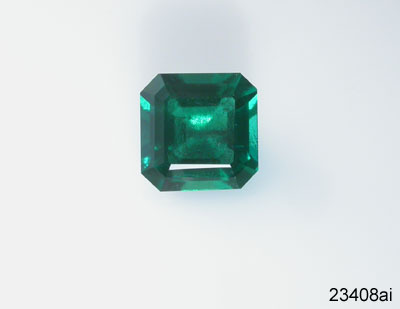 23575si 7x5 mm emerald cut We also have one 7x5mm man made hydrothermal emerald step cut in a rectangular octagon shape with slight inclusions. The weight is 0.85 ct. Priced at $65/ct. 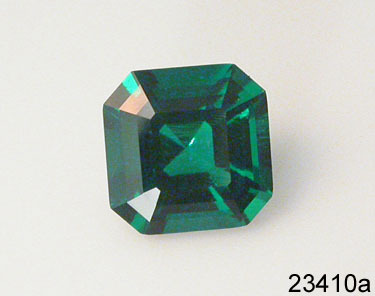 23575i 7x5 mm emerald cut There is also a 7x5mm lab emerald step cut in a rectangular octagon shape that has a moderate degree of inclusions (visible in the photo). The weight is 0.85 ct. Priced at $57/ct. 23586 8x6 mm emerald cut In the 8x6-mm rectangular octagon shape, we have one step cut lab emerald and one cut-corner radiant (not shown). Eye clean, with excellent green color. The average weight is 1.39 ct. Priced at $75/ct. The price shown at right is per gemstone. 23586si 8x6 mm emerald cut Also in an 8x6-mm rectangular octagon shape, these 7 5 step cut and 1 cut-corner radiant (not shown) man made hydrothermal emeralds have slight inclusions - small, but visible to the naked eye - which can make them look more like most natural emeralds. The average weight is 1.31 ct. Priced at $65/ct. The price shown is per gemstone. 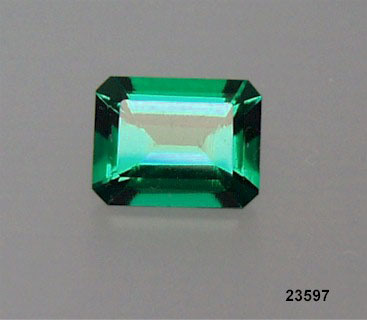 23597 9x7 mm emerald cut A 1.82 ct average weight for these man-made, rich green emeralds in a popular 9x7-mm rectangular octagon or emerald cut. 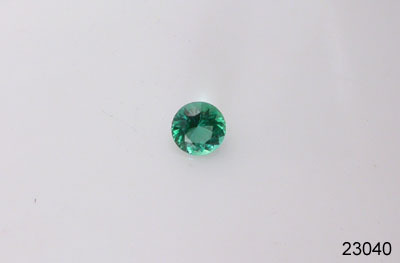 Very clean gemstones priced at $75/ct. There are 13 12 11 10 9 8 7 6 available, and the price shown is per gemstone. 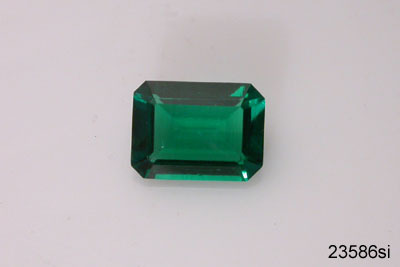 23597si 9x7 mm emerald cut We have 7 4 3 2 of these lab grown hydrothermal emeralds, one faceted in a 9x7-mm step cut and the other cut-corner radiant (right in photo). 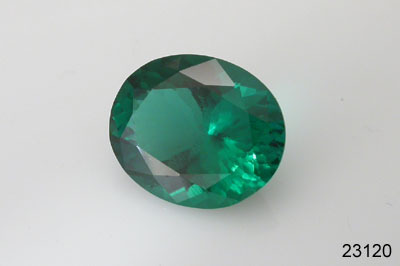 These are generally clean stones that contain a few Jardin-like defects which make them more similar to most natural emeralds. Great for a ring or pendant. Average weight is 2.05 ct. Priced at $65/ct., per gemstone. 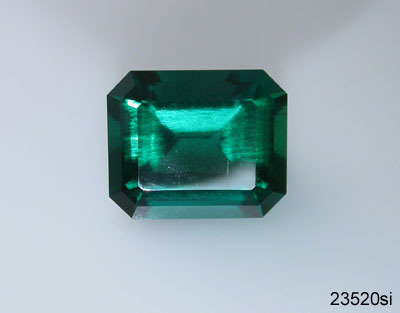 23597i 9x7 mm emerald cut There are 4 3 2 1 of these lab grown hydrothermal emeralds faceted in a 9x7-mm step cut and containing moderate inclusions, which make them look more like most natural emeralds. Average weight is 1.83 ct. Priced at $57/ct. The price shown is per gemstone. There are eight seven six four three two one step cut (classic emerald style) gems available in a 10x8-mm rectangular octagon shape. 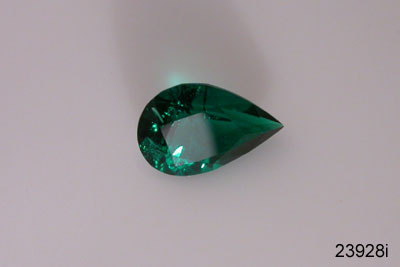 These man made hydrothermal emerald gemstones are eye-clean and have a deep emerald green color. 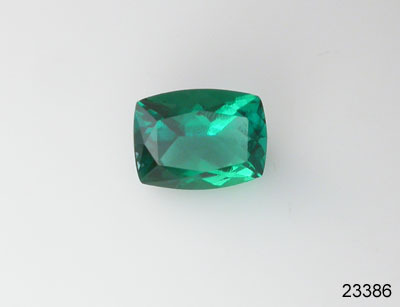 The average weight is 2.78 ct. Priced at $75/ct. The price shown at right is per gemstone. 10x8-mm rectangular octagon shape lab emeralds with some slight inclusions. 3 2 are cut corner radiant (on left in photo) and 10 9 are step cut (on the right). 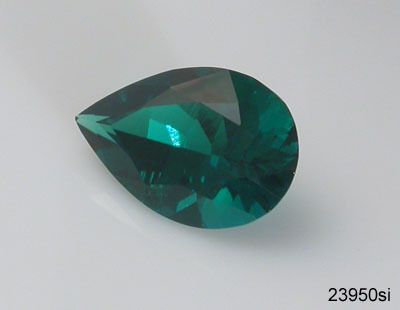 The average weight is 2.73 ct. Priced at $65/ct. The price shown is per gemstone. These are very nice gems for the price! 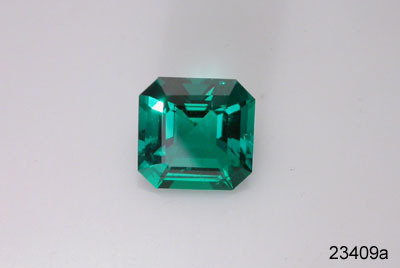 We also have five four three two 10x8-mm rectangular octagon shape lab emeralds that have moderate inclusions visible to the eye. 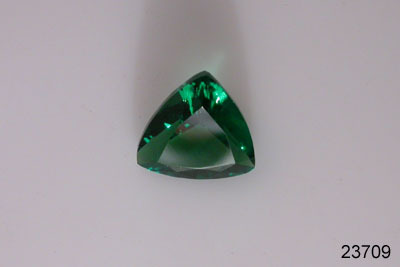 Faceted in a step cut, with beautiful green color. The average weight is 2.42 ct. Priced at $57/ct. The price shown is per gemstone. 23519 11x9 mm emerald cut There are 6 5 4 3 2 available hydrothermal emerald step-cut gems in the 11x9mm size, and one that is cut-corner radiant (not shown, but like the one on the left in 23508si). They are nice, eye clean stones with an average weight of 3.57ct. 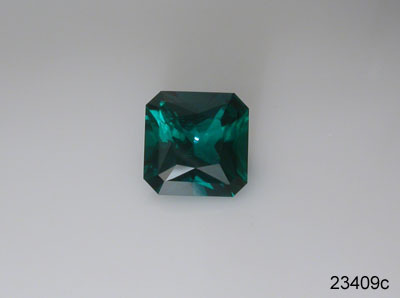 Colors range from traditional emerald green to dark blue-green. Priced at $75/ct. The price shown is per stone. These are beautiful gems! 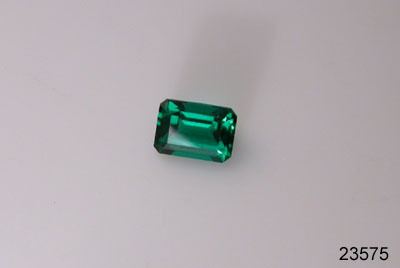 23520 12x10 mm emerald cut In the 12x10mm size we have 3 very nice step-cut lab grown emeralds with excellent clarity (eye clean). 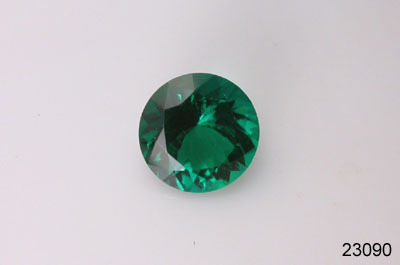 The color of these gorgeous gemstones is traditional emerald green, and their average weight is 4.75ct. Priced at $75/ct. The cost shown at right is per stone. 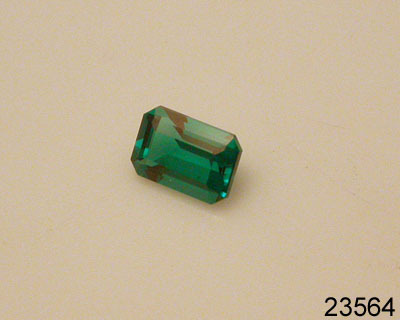 23520si 12x10 mm emerald cut These 4 created emeralds are 12x10mm in size. They're faceted in the traditional rectangular octagon step cut style. They have slight inclusions, but are very nice gems overall. The average weight is 4.897 ct. Priced at $65/ct., and the price shown is per gemstone. 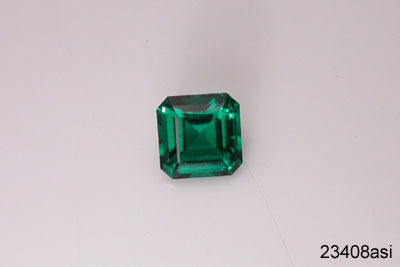 23540 14x10 mm emerald cut At the impressive size of 14x10mm, these are the largest rectangular lab-grown emeralds we offer. 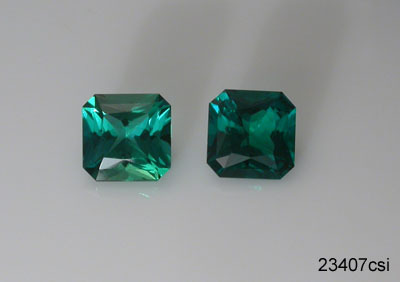 They are faceted in a traditional step cut, and are a deep emerald green color. The clarity is excellent (eye clean). They weigh 6.23 ct. on average, and are priced at $75/ct. Price shown is per gemstone, and 4 are available. 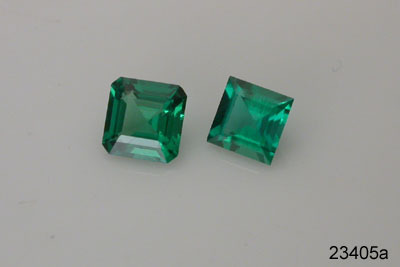 23540si 14x10 mm emerald cut These two gems are just like 23540 above, but they have slight inclusions. 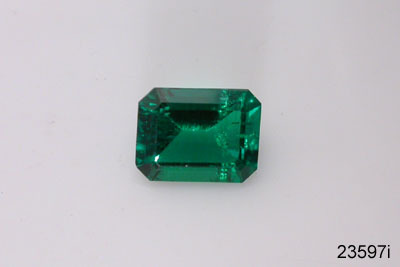 Large 14x10mm rectangular step cut lab emeralds with dark emerald green color. They weigh 5.71ct. on average, and are priced at $65/ct. (price at right is per gemstone). 23704 4-mm trillion These eight six little 4mm trillion created emeralds have a lot of fire for their size. Eye clean, with excellent color. The average weight is 0.17 ct. 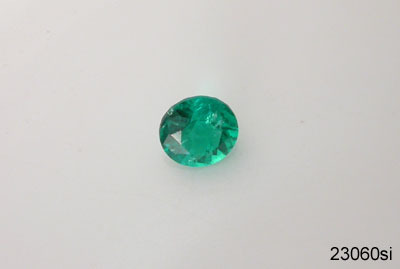 Priced at $75/ct., and the price shown is per gemstone. 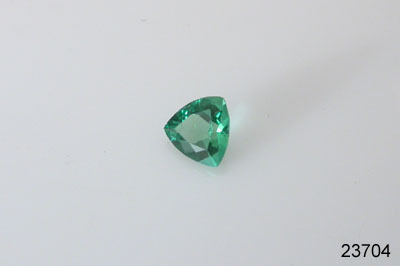 23705 5-mm trillion Five 5mm trillion lab emeralds are available. Both clarity and color are excellent. These would make very nice earrings. The average weight is 0.33 ct. Priced at $75/ct. Price shown is per gemstone. 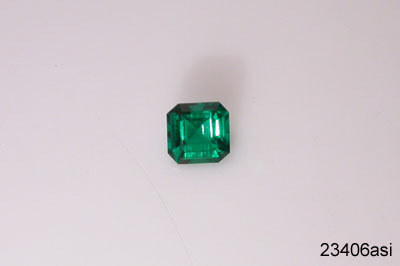 23705si 5-mm trillion There are two 5mm trillion lab emerald available in this shape. 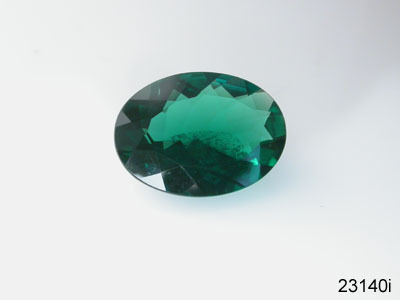 Both have slight inclusions and are a beautiful green color. The average weight is 0.37 ct. Priced at $65/ct., and the price shown is per stone. 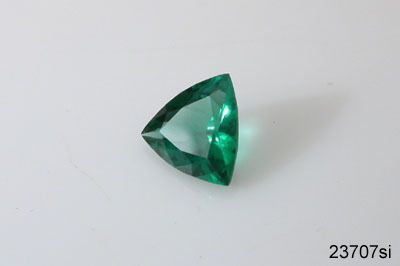 23706 6-mm trillion We have eight seven 6-mm trillion lab emeralds available at this time in this cut. Clarity and color are excellent. The average weight is 0.59 ct. Priced at $75/ct. Price shown is per gemstone. 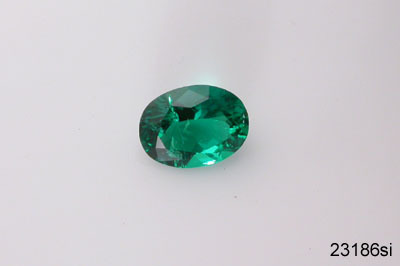 23706si 6-mm trillion We also have five 6-mm trillion lab emeralds available with slight inclusions. The average weight is 0.60 ct. Priced at $65/ct. Price shown is per gemstone. 23707 7-mm trillion In the trillion cut we have five three two 7mm lab-created emeralds available. Color, clarity and brilliance are all excellent in these gems. The average weight is 0.86 ct. Priced at $75/ct. Price shown is per gemstone. 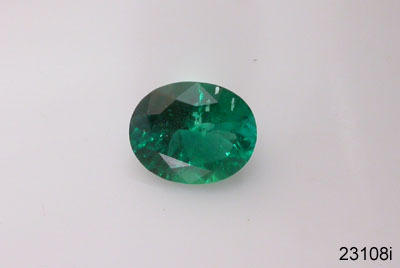 23707si 7-mm trillion Also in the 7mm size trillions we have four lab emeralds that contain slight inclusions. The color and brilliance are great. This is a versatile size gem. The average weight is 0.82 ct. Priced at $65/ct. Price shown is per gemstone. 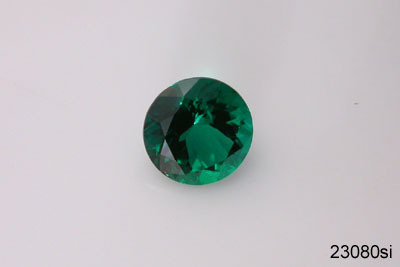 23708 8-mm trillion We have six created emeralds available in the 8mm trillion cut with excellent clarity. These are really very nice gems. Average weight 1.38 ct. Priced at $75/ct. Price shown is per gemstone. 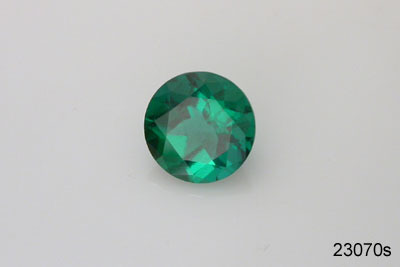 23708si 8-mm trillion Three 8-mm trillion lab emeralds are available with slight inclusions. Color is a rich emerald green. The average weight is 1.57 ct. Priced at $65/ct. Price shown is per gemstone. 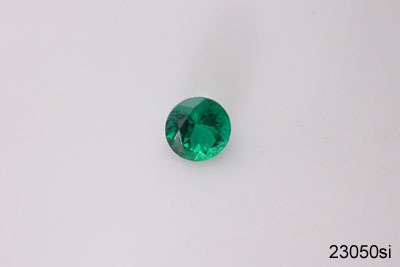 23708i 8-mm trillion There are also two 8-mm trillion lab emeralds available with moderate inclusions. The color is a rich emerald green. Average weight is 1.54 ct. Priced at $57/ct. Price shown is per gemstone. 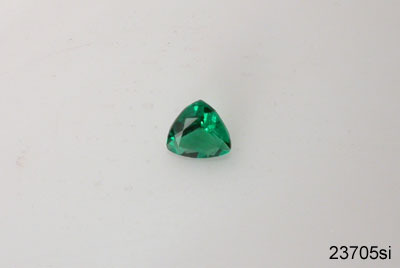 23709 9-mm trillion There are three 9-mm trillion lab emeralds available at this time in this cut. Clarity and color are both excellent. The average weight is 2.04 ct. Priced at $75/ct. Price shown is per gemstone. 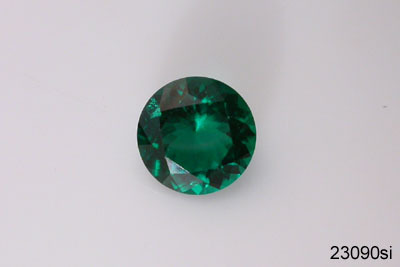 23709si 9-mm trillion We also have three 9-mm trillion lab emeralds available in this cut with slight inclusions. Beautiful green color. The average weight is 1.80 ct. Priced at $65/ct. The price shown is per gemstone. 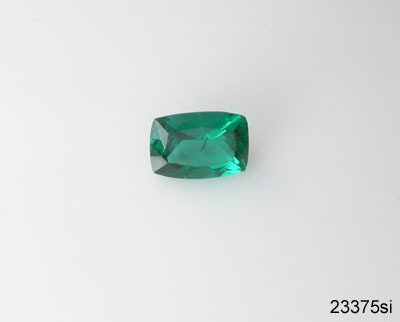 23709i 9-mm trillion We have one 9-mm trillion lab emerald available in this cut with inclusions readily visible to the naked eye. In this case the inclusions give the stone extra sparkle. 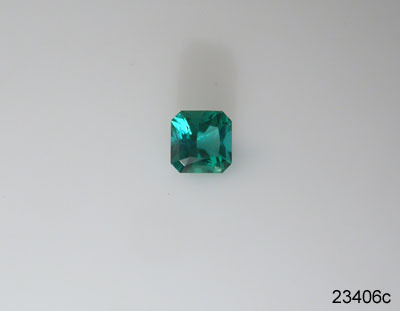 The weight is 1.94 ct. Priced at $57/ct. 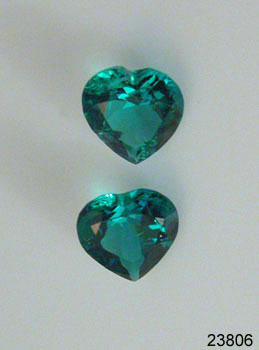 23710 10-mm trillion These gems would make a beautiful pendant! 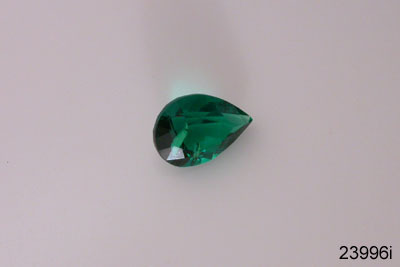 They're 10mm trillion lab-created emeralds with excellent clarity, color and brilliance. Three are available. 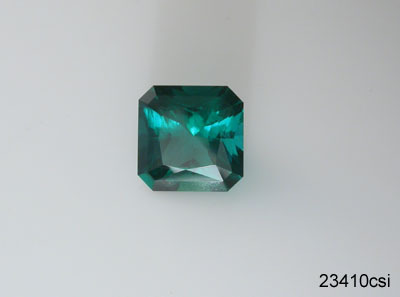 The average weight is 2.74 ct. Priced at $75/ct. and the price shown is per gem. 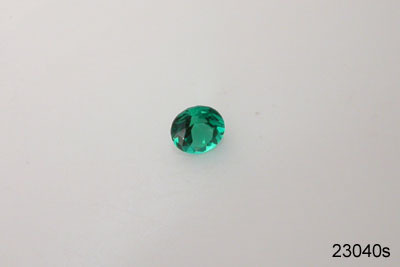 23710si 10-mm trillion There are four three one 10-mm trillion lab emeralds available which have slight inclusions and excellent green color. Average weight is 2.50 ct. Priced at $65/ct., and the price shown is per gem. 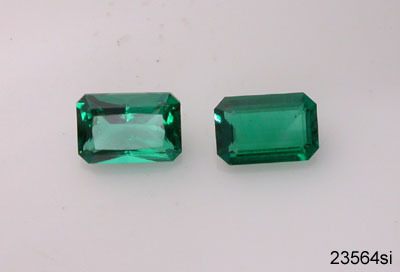 23711si 11-mm trillion These three lab emeralds have just slight inclusions. The color is still excellent. They're faceted in an 11mm trillion cut. The average weight is 3.12 ct. Priced at $65/ct., and the price shown is per gemstone. 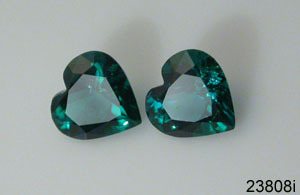 Faceted in a 6mm heart shape. 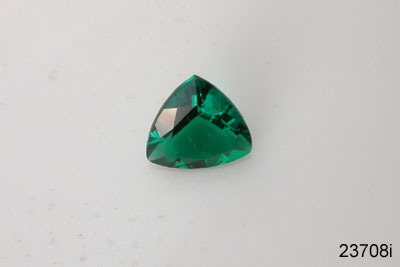 These 5 man made hydrothermal emerald gemstones are eye-clean. The average weight is 0.64 ct. Priced at $75/ct. The price shown at right is per gemstone. 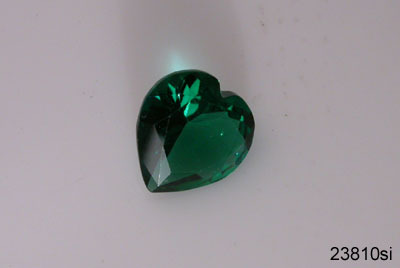 We have two lab-grown emerald faceted hearts in the 7mm size. These are eye clean, with nice sparkle and green color. They would make very nice earrings! The average weight is 1.00 ct. Priced at $75/ct. The price shown at right is per gemstone. 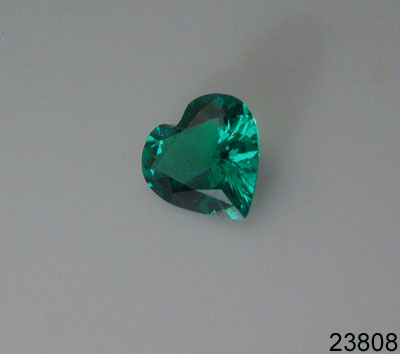 These 8mm heart-shape lab emeralds have one or more "Jardin"-like veil defects visible to the eye or under 10x magnification, but the clarity in un-included regions is very good and the stones are bright. There are 8 7 available, and the average weight is 1.37ct. Priced at $57/ct. The price shown is per gemstone. 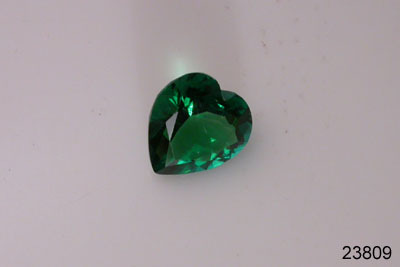 There are seven 9mm heart-shape lab emeralds available. Clarity and color are both excellent. The average weight is 2.09ct. Priced at $75/ct. The price shown is per gemstone. 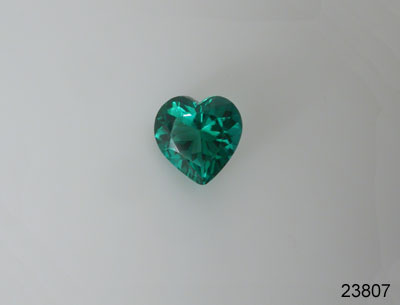 In the 10mm size we have two lab-created heart-shaped emeralds with slight inclusions. The color is a beautiful emerald green. The average weight is 2.61ct. Priced at $65/ct. The price shown is per gemstone. Remember that we can set these gemstones in a variety of mountings. Ask for details.